The first time I experienced the Loose Marbles was a couple of years ago while walking around the Quarter with my good friend Eddie. An excellent experience it was. 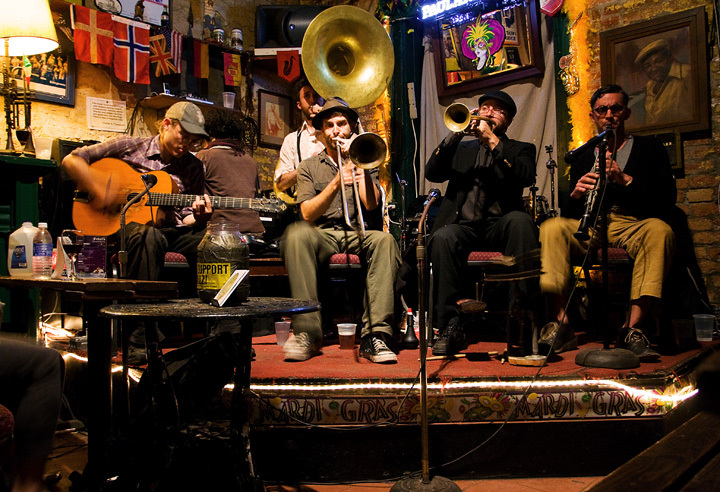 The Loose Marbles are a loose band of throwback musicians who bring 20’s and 30’s style jazz roaring back in the streets of New Orleans (and New York) and occasionally play in local clubs. Members float in and out depending on the day and the place and they have a fashion sense that could be affectionately described as vintage-vagrant. But the music and the swing dancing that surrounds it is outstanding. We saw them busking during the day and then playing at Fritzel’s that night. The photo above is one I took that evening. Still love what they do but they are not the point of this post. When I got home from that trip, I was craving some more so I Googled and YouTubed and found some videos of the group. Mostly just hand-held street shots but there was one video that changed the focus of my search. It was the band playing on Royal with a female singer. A singer that blew me away. This is that video. We’ll pick up the story after you watch. So after I saw that, I had to find out who she was. More Googling turned up the name Meschiya Lake (pronounced ma-shee’-ya). I couldn’t find out much about her at the time but I was fascinated and decided I would try to see her sing in person the next time I was in NOLA. In the street. In a club. Wherever. That was two years ago. I’ve been back to the city a couple of times but circumstances and schedules didn’t cooperate so we never crossed paths. In that time though, Meschiya’s career started to take off. I found her Facebook fan page a while back and started following her. She released an album last year called Lucky Devil and sings with a band called The Little Big Horns, which I’m sure has connections to the Marbles. But they seem a little more polished as you can see in this video from a few months ago. Lovely, powerful and passionate music. I’m not sure if she still plays the streets but she’s always playing local clubs when she’s in town. And she travels the country and the world playing but I’m not sure you’d say she’s “made it” yet. Which gets me closer to the point of this post. But first, something cool happened a few days ago. I finally got to see her perform live. 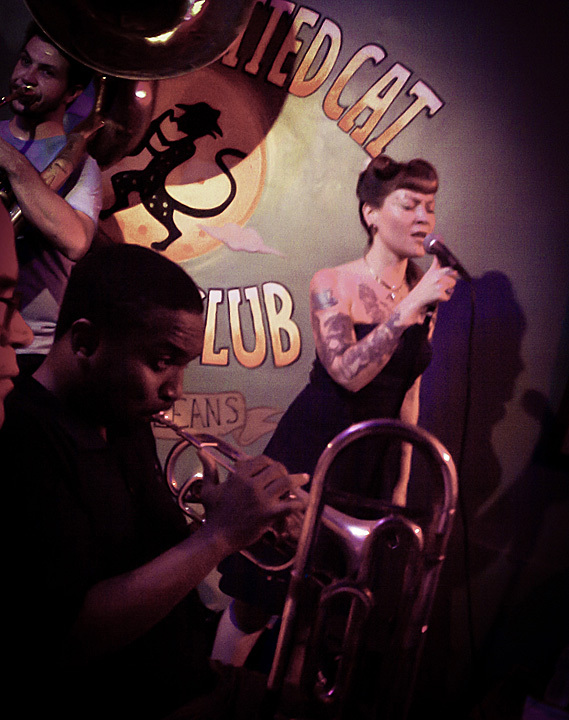 Julie and I spent a wonderful long weekend in the Big Easy and Saturday night spent the entire evening wandering in and out of clubs up and down Frenchmen Street topped off by Mescheiya Lake and the Little Big Horns at The Spotted Cat. The place was packed but fortune and Julie flirting with the bouncer got us right next to the stage. Loved the show, bought the album and thought that was that. But once again, when I got home I was craving some more so I Googled and YouTubed and among other things, here’s what I found. There’s a documentary in the works about Meschiya. True Family: The voice of Meschiya Lake is in post production. Oh hell yes. The trailer looks so good I can’t wait. Check it out. But it looks like I will have to wait for a little while. Which finally brings me to the point. The movie is being made by a Danish filmmaker for the love of the music and the subject. The money is coming from a very cool newish way to raise cash for projects like this; crowd-funding. Tens, hundreds or thousands of people giving whatever they can to projects they believe in to get them off the ground. Films, music, charity etc. $5, $20, $100 at a time. Adding up until it’s large enough to light the fuse and launch a dream. The Meschiya fundraising is run by IndieGogo but there are several other companies doing it. My friend Brian Meece is a co-founder of RocketHub in NYC and they’re getting a lot of press and praise. (He’s also part of the über cool group Brian and Silbin) It’s just such a great way to kickstart a project (Kickstarter is another) and give it a chance to be seen and picked up by a larger audience. The Meschiya movie is short of its goal but the project is still moving along. I’ll be putting some of my money in the pot because I think it will be a great story and I think the more people who are exposed to her music, the more people will fall for her and she will “make it”. That may make it harder for Julie and I to get a spot next to the stage in the future, but that’s a risk I’ll take. This post of yours is about a year old. I can fully understand why you felt compelled to find out more about the girl. After coming across a youtube clip of her some months ago I also became a bit obsessed. I guess it’s the surprise to see how this young people dig the real thing…these bands playing on the streets…Meschiya definitly has got it, but I feel that their movement still needs another turn of the screw. It may be pendantic for me to say this, living so far from NO, (Argentina) . But I´ve been involved with this early music since I was a teenager…now I’m an old man, I wish I could have the company of these kids!. So good luck to her, and the new revival that seems to be taking place. To Earling Garvie: From personal experience (Meschiya is my sister), I can say it’s one thing to see her perform in a video (especially the older ones) and something entirely different to see her in person. To be true, some of her past bands could definitely use, as you say it, another turn of the screw, but I really hope you get a chance to see her in person sometime. There’s a vibrant energy that comes from her and the band, and especially if the dancers are there too, it’s all pretty amazing. Indescribable joy. I only get to see her a couple times a year — she’s always been talented, but this last time, I literally got goosebumps to hear her sing. I love that girl. If all the papers come through in time, she’ll be in South America, Brazil, the early part of August. I’m sure she’ll post whens and wheres on her Facebook page. Maybe you’ll get a chance to see her then, and knowing her, if you’re an old Jazz musician, she’d love to meet you too. Maya, Meschiya….do I hear Poland bubbling down there?. Many thanks for your kind reply. What was I thinking about with “another turn of the screw”? Certainly nothing needs to be added to her singing…maybe the bands…but that other girl..plays cornet…(G.Cohn?) …she’s got it too. The original masters were really so good…but to see young musicians looking closely to their home tradition instead of only yearning for Berklee credentials is moving indeed. Anyway…Brazil is still a long way from town, but if she is getting that close, she might be coming down to us soon. I will certainly keep track of her. Big South-American bear hug! Brian, Earling, and Maya. Meschiya has asked her friends NOT to support True Family film. She and the film maker had big differences. The Little Big Horns are all top-rank musicians – my son is a band member – and the band is very tight. The current band has been together almost two years. And for the last two years in a row, Meschiya has won the prestigious Big Easy Music Award for Best Female Performer in New Orleans. Among recent highlights, Meschiya Lake and the LIttle Big Horns toured the UK in February 2012, were featured players for Camp Jitterbug in Seattle in June 2012, played Lincoln Center’s Midsummer Night Swing June 29, 2012 in NYC (search for 4 great You Tube Videos of performances), will play Brasilia and Belo Horizonte, Brazil, August 4 and 5, for I Love Jazz International Festival – google for I Love Jazz home page for the place and times. Then there is Tonder Festival in Denmark in late August, followed by another UK tour through mid-September. Tonder and UK details on their UK booking agents’ page. http://www.brookfield-knights.com When they are in town in New Orleans they usually play Mimi’s in the Marigny on Mondays, The Spotted Cat on Frenchmen Street on Tuesdays, and other Frenchmen Street clubs on an irregular basis, such as dba on Friday nights, and Spotted Cat again on Saturdays. On Thursdays, the Meschiya and three Little Big Horns play the cocktail bar of the 4-star Wndsor Court Hotel. They have working on a new CD for a while, and I expect them to release it sometime in the fall. “Lucky Devil” their first CD released about two and one half years ago (with some different band members) got great reviews here and in the UK and continues to sell nicely at CD Baby or through Meschiya’s web site.www.meschiya.com Meschiya also has two Facebook Pages under her name, one with the band, and the other more personal, and both are a good way to keep informed about the band’s activities. “Play Jones” home page (click “live venues”; click “Spotted Cat”) used to live stream on the internet all band performances, including Meschiya’s, from the Spotted Cat, but they went off the air with no explanation about two weeks ago. Check the site, though, they may come back on line. If so, there is a monthly calendar below the small screen, which lists at Eastern times, the bands playing and the times. Thanks Ron for your update. Brazil is as closest venue to my place, but it’s still as far away as say, California to Canada. I will keep track of the her and the band’s news. Thanks again Ron. I am gradually moving through the clips, enjoying the performances of both Meschiya and the Little Big Horns. Young energy, feeding the best New Orleans tradition. I just looked up the Brazilian festival, that took off last friday. I will see what can be done with the Lindy Hop people here…I’m bound to come across them at one of our gigs. But things take a long time in this country, and sometimes results are frustrating. All the same, you never know.. I Love Jazz International Festival, Live Performance Videos.